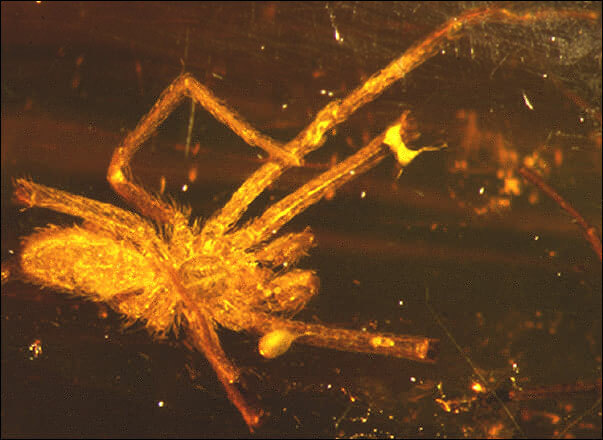 A scientist has described a spider that was trapped and preserved in amber 20 million years ago. Palaeontologist Dr David Penney, of the University of Manchester, found the 4cm long by 2cm wide fossil during a visit to a museum in the Dominican Republic. Since the discovery two years ago, he has used droplets of blood in the amber to reveal the age of the specimen. It is thought to be the first time spider blood has been found in amber and scientists hope to extract its DNA. Dr Penney, of the School of Earth, Atmospheric and Environmental Sciences, said he had used the blood droplets to trace how, when and where the spider died. It is a new species from the Filistatidae family commonly found in South America and the Caribbean. It's amazing to think that a single piece of amber with a single spider in it can open up window into what was going on 20 million years ago Dr David Penney, University of Manchester Dr Penney believes it was climbing up a tree 20 million years ago when it was hit on the head by fast flowing resin, became engulfed in the resin and died. He claims the shape and position of the blood droplets revealed which direction the spider was travelling in and which of its legs broke first. "It's amazing to think that a single piece of amber with a single spider in it can open up a window into what was going on 20 million years ago," he said. "By analysing the position of the spider's body in relation to the droplets of blood in the amber we are able to determine how it died, which direction it was traveling in and even how fast it was moving." He first saw the fossil during a visit to the Museo del Ambar Dominicano, in Puerto Plata, Dominican Republic. Dr Penney reports his findings in the latest issue of the journal Palaeontology.